Portfolio presentation Wednesday, March 23, 2011, 7 p.m. The TWIST - Tuica/Tusovka project starts from the curatorial research of Viviana Checchia in the Slovak Republic and Eleonora Farina in Romania. 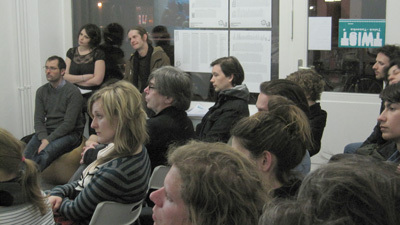 The material gathered during the curators’ respective time in Bratislava and Bucharest will comprise an ‘open office’ at golden PARACHUTES for the duration of the events in Berlin. In spite of the twenty-odd years since the fall of the Berlin Wall, the differences between the Romanian and Slovakian countries have been subsumed under the Eastern European umbrella for many years, a term that mystifies as much as it reveals. Showing affinities between each context, as well as contrast and diversity is a fundamental motivation for the project. Berlin has been chosen as a location for the event because of its role as the epicentre of Europe’s political and geographic struggles in the 20th century. The ‘open office’ is a way for the public to read, watch and deepen their understanding realities of each country’s cultural landscape during a week of direct interaction with the material. In addition to a paper, video and audio archive, experimental video works will be presented at golden PARACHUTES, including works from the film festival unarte_fest, University of Fine Arts in Bucharest; Platforma DigiVAF(ex), Academy of Banska Bystrica; the Faculty of Art’s students in Kosice and the internet-based show Hore Bez. A rich programme of events will run parallel to the ‘open office’, which will include the participation of important representatives of the contemporary art world in Romania and Slovakia with the aim of establishing a permanent dialogue between the two. The support of the Library of the Institute for East European Studies at the Freie Universitaet will enrich the archive with its own bibliographical materials.